Looking in the xml files seems to be a nightmare to disable them someone needs to spend hours and hours to make a mod for tech to work properly. Stardock, Frogboy and anyone there, please give us back the full tech tree I'm sure most players will agree with me. Tech tree has been shortened so much and cut lots of good stuff in the game. At least make it an option when we start a game we choose free or specialized. Don't force this terrible limitation.. Personally this made me to stop playing the game I will not play untill this is fixed or there is a mod which seems very complex someone needs to rewrite the entire tech trees for all races! I do not like the Tech Ages, and I do not like either the exclusive specializations. I miss the total freedom of research present in GalCiv2. No Tech Ages, no exclusive specializations, no "1 tech per turn" limit (if I build a strong civilization for research, I can research several techs per turn), complete freedom for my civilization for the research path. I want to have the choice, to lead my civilization where I want. The choice must come from what the player wants to make with its civilization, and not be the result of arbitrarily imposed barriers (Tech Ages, exclusive specializations). The specializations should be complete branches of research with successive techs to further improve them, and fully accessible. Without exclusive specialization, I can choose a specialization because I need its bonuses now, at this point in the game, and come back later to select another specialization tech, according to my development. With exclusive choice, I need to choose the tech with the best bonus for the duration of the game, it's not a real choice. And each game, I will choose exactly the same tech because I get the best bonus from it. No strategy here, just pick the best. "I take the best tech for the long term, otherwise I am an idiot." Strategy, it's also to adapt. I want to adapt to the specific events that happen during the game, and not to adapt to a predefined tech tree arbitrarily diminished, it's not at all the same thing. Instead of putting barriers everywhere, it would be much better to have much deeper and rich tech trees, with so many interesting possibilities that the player wants to research them all, but can choose only one at a time. This should be the spirit of the game. This is where the choice should come and not from limitations. There will be no frustrations here, just the pleasure to choose a technology and to choose the others later. This is smart design. This is Strategy. Made an open design rather than a closed design. Without constraint and without barrier, so the player can have an interesting game experience. I want to have fun and joy when playing the game, instead of frustrations and limitations. So, where are the options to disable them. Bear in mind, you CAN trade other races for the tech too. To me, this is worse than simply being unable to obtain the other mutually exclusive technologies. For the technologies to reasonably be mutually exclusive, you need to be making tradeoffs that prevent you from getting the other benefits. Otherwise, there's little good reason why I could not, given sufficient time, develop those other benefits on my own. Being unable to obtain the other specializations by research is fine; it just means that whatever tradeoffs I made to get the benefit I chose are incompatible with getting the other benefits. Being able to obtain these other benefits via trade undercuts this; now, instead of having made tradeoffs which were incompatible with obtaining the other benefits, I simply haven't spent enough time looking at the problem, as there is clearly a set of tradeoffs which gets the full benefits of each specialization. This should not be possible, or at least it should not be impossible to develop through research and yet entirely possible to implement just by talking to the neighbors; at the very least, I should need to spend some time figuring out how to incorporate their tradeoffs into my system to get the benefit (i.e. trading for the technology does not instantly give me the technology, it just gives me the opportunity to research it). Alternatively, the specializations need to not be strictly beneficial. Maybe that +10% factory output costs me +5% in maintenance because the higher output means more wear and tear on parts, that -10% maintenance costs me +5% construction costs because high-quality parts are more expensive and harder to make, and that -10% construction cost reduces factory output by 5% because the cheap parts just cannot handle the wear and tear of normal operations. Now instead of it being strictly beneficial to obtain all three specializations, you can see evidence that we've had to cut back on some of the tradeoffs that gave us the benefits listed in each individual tech. The factory with all three specialization techs is still better overall (it has +5% output, -5% maintenance, -5% construction costs if the multipliers are additive, or +4.5% output, -5.5% maintenance, -5.5% construction costs if the multipliers are multiplicative), but it's worse in any given category than the appropriate single-specialization factory would have been, and the factory with any two specializations is similarly placed. With tradeoffs in place, it actually makes sense why you might not take the time to research the other benefits, because you're happy with the set of tradeoffs you picked and you don't want to rebalance the tradeoffs to some other standard, and you don't magically obtain the full benefits of tradeoffs that ought to be conflicting with one another just by talking to the neighbors, though you do still get some benefit out of it. Or, if you don't want the tradeoffs to be against the bonuses offered by the specializations, come up with a fourth metric you can trade against - maybe each of those bonuses to the factory are the results of changes to labor laws, with reduced maintenance costs being the result of a lower standard wage for factory workers, the reduced construction costs being a result of less stringent safety standards, and the increased output comes from increased shift durations, all of which translate to a trade against a planet's approval rating. Holy crap, I'm being forced to play with one race at startup I cannot stand this limitation anymore. I want to be Yor and Drengin and later on Humans and maybe some Altarians... whatever that might be good for... so many options and choices but no penalties of corpse. Ideology was already enough to pick between 3 choices everytime you colonize a planet, game already had this. Putting a limit in research and say no you can't research this even when you have already your own tech tree with different options there is a new illogical rule and says you can't research everything just because. And who says about strategy, no matter how many games you play you always choose the same thing, the best one. GC3 has become a very restricted game which you have to play by the rules, no freedom allowed. While it's visually a lot better than GC2 it's not that good.. I'wont go about strange issues and mechanics which look plain wrong like culture flip for planets but no for shipyards or starbases, no borders anyone can roam freely, improvements whic you have to build from level 1 even when you have level 4.. they are annoying but at least you can ignore them. But when I play GC1 GC2 and GC3 and suddenly you get a new rule which says no you can't do this anymore.. well I won't play it at all I don't like restrictions. And here there are some people who want to defend this and call this great... oh yes I have a new lim.. strategy now I can choose what I want instead researching all the time its sooo boring you know pfff.. It's like going backward, games of the past had many limitations modern games instead coming closer and closer to reality unfortunatelly GC3 is not one of them. Sorry, I couldn't pass this one up. a form of play or sport, especially a competitive one played according to rules. Wow so much negativity. I like the change, its a good one. Definitely in the right direction. Restriction is good, it forces you to make painful decisions. It's good for game play and replay, just look at all popular boardgames, how well thought out mechanics they have and how you cant do everything at once while playing. Computer game should learn a lot from them. Hard decisions needs to be made every turn, just like a good 4x game should be. This change makes the game a lot more interesting for me, well done developers. More restrictions please. @alpha perhaps you'll notice also that some of the people who have defended the new "strategy" have also admitted that to make it viable, things need to be rebalanced. I've said that I like the concept but thinks it needs balancing and some editing to make it yield the kind of strategy and choice that make it meaningful. As for the direction of gaming... I can think of many modern games that are more limiting and streamlining than games of a generation ago. Some are some aren't. There is more complexity than in GC1 or GC2. Some I don't like. Some I like. But I don't see this thing going backward. If it were going backward, it would go straight back to the way things were in GC2... which you seem to prefer. But this is especially true with open tech trees, no matter how big it is, how many thousands of techs, there will always be an optimal order to research everything in, or which techs in which catagory to go for first. Players figure that out, and then do that for each game. Instead of having to make a choice about which is the 'best' specialisation tech, you just build that first. At the very least, it's no better than a restricted tech tree. I strongly feel that 'open' research trees give less depth, choice and replayability, not more, but recall the initial satisfaction of completing the entire (modded, of course) tech tree in GCII and so can understand why others strongly feel that open trees are essential for their gameplay enjoyment. But ultimately, finishing the tech tree in GCII was more a case of artificially extending games I could have finished off a hundred or so turns ago just to complete everything, (if you're in a position to do it, you are utterly dominant and under no threat whatsover, right? Will that be any different in III?) and I eventually felt that chasing down each and every tech was pointless and was just preventing me from starting a new game that might have had me fully engaged and enjoying myself, rather than grinding on in the current one. Each to their own, I guess. The problem is as I pointed out in another post there really is not an even choice for these specializations. The three choices we are presented with for each of these techs are in no way equal. If this is the problem then this needs to be addressed. Specializations need to be balanced not eliminated. I hear you saying that we need to mod it out. I for one will not play a mod that only eliminates specialization, but if it had other features like harder, or 128 factions then I might play it, but I understand them making that mod able. I would like to elimination, and optimization. I do understand for balance reasons sharing some of the techs. I think that only specializations only have all of one branch, but for balance reasons it is imperative that some of the techs in some of the branches be shared by some, or all specializations. So for a human player we will most likely all ways pick the best option every time. Another good argument for balancing not eliminating specializations. Granted, Stardock having just made the decision to limit specializations, some balancing is required, but I like it. You can, if they choose a different one and you can trade with them at point. I can see reason to make some of these techs untradeable or unstealable if stardock so chooses, but this is something I leave up to the developers. The game was shaping up well but just before release the devs have decided to add a bunch of arbitrary restrictions on game play. Amazing you didn't see this coming the game is still in development. I'm not happy about it but I was hoping that Stardock would keep a play how you like to play attitude rather than force players to mod the game to achieve that goal. When does the mod tool come out because I am really not thrilled with the prospect of modding every single tree in the xml files. I've been asking for this for 2 years, so this is how I would like to play. I agree that this should be an option for modders, not that I'm planning to play this mod without some other reason to play this. I hope the mod tool is better this time around. I'm into game editors. I made a few scenarios with this last time. I hope it is easier to put into folders this time around considering windows has made this more difficult this time around. Thanks Bill Gates for making my life harder again. The real issues is of each specialization tech we are presented with two rather poor choices and one that actually is a real game changing bonus. So our choices are pick the one that helps us win or choice the ones that put us at a disadvantage over the other players. I think that we should be focusing on this instead of eliminating specialisations. Why don't you specify examples of this no matter how numerous this may be, so they can fix this. We should make a post for this. I can see your point on multiple techs per turn. I think the problem is balancing. That is why I like the idea of tech points. A limited number given from the start of the game. I guess the interface is the first problem do you point techs in tech1 and so on, or do you put points in kinds of techs being to group together groups if you don'tput points in all groups. Randomly added if all groups are not picked, or not. Maybe deviding tech cost by points and multiplying by what speed your using. You could do this at the beginning of the game, or this would be better if it was an in game option. This was one of the ideas I supported. complete freedom for my civilization for the research path. The idea of specialization is to help the way you play even more. My reasoning for this was so when I guided my civilization I felt the impact of my direction even more. I understand that not everyone wants the best challenge ever. I have to live with people that think games should only be a limited challenge. I think tech ages help the Ai. more than anyone else. Anything for a challenging Ai. Agree on complete branches. You could just not have as many techs in non specialized branches. There were always a hard limit on how far you could go down one branch anyways. Fully accessible depending on where you research to improve the way you play anyways. If we worked from the other way, and never had only tech tree then this would be cheesy, and honestly how is this different from when each race got it's own tech trees that usually were stronger in some areas while being weak in other's. What's baffling is that I don't understand how that choosing tech by the way you play is not making a choice. Again balancing is more of a issue than tech specialization. If there is a best, and not best for only certain strategies on each one then there needs to be a balancing not eliminating tech specialization. Not the same thing it's another kind of thinking gameplay, but are still arguing that there are at least some who want this. This is not supposed to be a barrier, but a way to help you play the way you want to better. I'm game lets make much deeper and richer specialized tech trees. How is this limitation. Eventually this will compliment your gameplay instead of limiting it. As far as tech richer, and deeper the merrier. Since when are games not frustrating. That is part of playing them. Isn't it frustrating when you throw everything but the kitchen sink, and still lose. I think spcialisation is better design. Good vs. better. How researching not a forced choice, or how is playing anything but sim city not a forced choice. I do understand how this would have been easier if the game had it to begin with. That is a problem of older games. Agree this is why I don't understand your problem specialization is more not less choices. I do think that they need to replace techs they take out. I think that the trees need to be at least as big as Dark Avatar's, but they have been shrinking trees since Twilight. I do like as many options as I can get in games. You must've not liked the penalties in Twilight. Moot point. Good point, but this is probably dealt with untradeable unstealable techs. Good point let's go back to Dark Avatar. Agree, you must be new to the forums who's strategy do we use. I'm guessing that happened in Twilight that unless you were Human you didn't get all the techs, trade goods, super projects, or trade goods. I'm guessing you play only Dark Avatar for this reason. Our government and universities do this all the time. What's the difference. I always thought it was a bit odd that it wasn't 'pick one at the exclusion of the others'. In the end I treated them no differently than any other tech and I barely noticed any penalty towards making a informed choice over just picking at random because it seemed so easy just to get all the others. I like that now I have to think about what choice I make. This wasn't the only way they could have gone. They could have kept all choices open and still made the first choice more important than it was. They could have made diminishing returns from going back to pick a second and third tech from that specialisation. For example, say you had something that gave a 10% bonus if you pick it first, if you select it second it drops to 5% and third to 2%. You could therefore still get all three, but the order would matter. They could even take it a step further and make it so taking a second and third option also weakens the first tech as well. Whether they keep it as it is or change it, it really won't impact my enjoyment of the game all that much. The idea that what they have done is has made the game unplayable in some way is a bit over the top. 1) Get some perspective, it restricts a tiny number of tech specializations. 2) Do as you suggest and go play another game. I think restricting specializations is one of their best design decisions, though I an see those few who don't like it continue to be very loud and over dramatic about it. Not happening. I am very very much against the idea of being able to pick all 3 specializations. They're supposed to be a CHOICE you're making at the exclusion of the others. Very glad to hear this Frogboy, that means those of us who agree with this can relax. It also seems clear from this thread that most people here don't agree with the OP as they assumed. What am I hearing? Did you or did you not give us full tech tree from start- for 5 Betas you gave us full tree! In Beta 6 you limited it. Now people are angry towards you- its not your opinion to make! Its peoples! Or you dont care whether the means.... Is this officil Stardocks policy too? To disregard poeple? So are you saying that Stardock should disregard those of us who agree that specializations should be limited instead? You seem to think all player share your opinion and we don't I assure you. Also your sense of entitlement is misplaced Frogboy can make any decision he wants, it's his company and this is a game in active development, the fact is what some people are strongly for this decision and some people are strongly against it like you while others don't really think it's important, Stardock are designing and building the game not you or me and as the saying goes you can't please all of the people all of the time. You realize it won't be that hard to mod out, right? Given the heat that this is generated, I won't be surprised at all to see many Day 1 (or perhaps Week 1 to give people time to test) mods that deal with this feature. Of course it is and no doubt someone will soon after the release, but to be frank people don't tend to be very rational when they are clearly spitting the dummy. no matter how many games you play you always choose the same thing, the best one. your games must be very boring then. the way I see it is that, as each game progresses, it should present a various array of difficulties which have to be addressed correspondingly. granted, the current ways-to-win are too much the same because of some mechanics that still need balancing, but I'm sure this will change in the near future. if I go back and start a TOTA game I don't know what will happen, and what I will have to choose because most games develop differently and I've played half a thousand games so far. of course I make a plan but that plan usually gets disrupted multiple times by stuff that turns up, events, AI choices... so I have to adjust, and I do that by making different choices. this is what a good strategy game should do for you in a nutshell. and because different games develop differently, you can't know beforeahead, "what is best". you'll have to see, and I haven't seen any data or calculations here in this topic which would support these claims of "what is always best". So for those specializations there is only one real "choice" and for weapon techs it is the same. We can either make the weapons cheaper, smaller or lighter. The first two are obvious as to how they would help. The third I can assume makes the ship more maneuverable and harder to hit. Again this is a stupid choice to be forced to make. where people *assume* (instead of *knowing*) and use this guesswork to jump to non-constructive conclusions ("stupid"). maybe some choices are weaker in most games, then the correct way of action would be either boost those or weaken the strong choices, but I haven't seen a single presentation (of the people who are against the specialization) in this thread or the others. I'm surprised this person hasn't complained about random events and not being able to pick all three options. [e digicons]:rolleyes:[/e] The idea of this being a game breaker is just making me realize how some people will cry over anything. At first I was going to be rational and just say why not make it a selectable option. With the way you cried like a child in Walmart for not getting the toy you want now all I can say is Stardock leave the system as is, this is hilarious. Don't bend over backwards to please a spoiled child. 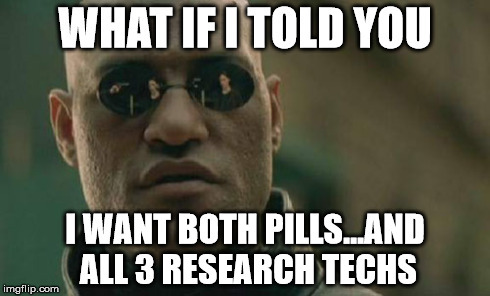 What would have happened in the Matrix if Neo started crying he wanted to take both pills, lol. I really think this is blown out of proportion by a vocal minority. They made the game the way they thought it would be fun. They also made it moddable so that those who wanted a slightly different play style could also have fun. It's not like exclusive specializations is a core mechanic of the game that is hard wired into the code. and perhaps all other ideas in between, such as rebalancing specializations so there isnt one clear good choice and two mediocre choices. Someone correct me if I'm wrong, but Master Of Orion II had the exact same limitation...a choice of 2 or 3 techs on the tech tree. I remember having to choose between Bio Domes and something, etc. This irritated me from time to time, because I wanted ALL techs. However, I really learned to appreciate having to make the choices. There was a racial trait, "Creative" I think, that allowed all techs...no choice necessary. I stopped picking this because it took some of the strategy out for me. Eventually I developed a pattern, this tech followed by that every time. However, it was nice to make the choice once in awhile, resulting in a slightly different game. I'm not trying to preach. The point I'm making is I think this will give the game a much longer life. I like the option to play the exact same race, follow primarily the exact same strategy...and change in mid game. Devil's advocate: could the developers put in a simple racial trait like "Creative," for those that don't agree? Just a thought. Indeed MOO2 (my fav game) had this limitation and it was irritating me too but I had the "Creative" option, there was an option.. There should be an option in GC3 to disable specialization or at least a trait. There are gamers like me who disagree with them and others who like them so Stardock should respect that. Plus as many posters said better balance is needed too many techs are specialized..
Like many others, I like the specialization, but I do agree with BuckGodot on the extreme worlds aspect. It seems to me we should be able to colonize varying planets. so Stardock should respect that. Rubbish. They make decisions that best fit the overall game design that they have, and there is no should about them having to do anything else. If you disagree with their direction, then all you can do is ask and hope your opinion matches theirs. In this case it doesn't, so you'll have to mod it. ...and as much as I loved MOO II, creative was the single most broken part of the game. If you played with that trait, you won. This close to the release date there is only one realistic way for the Devs to rebalace the tech tree. That is to identify those best techs and nerf them. There is no realistic way for the Devs to put in the time to figure out how much the poor techs need to be increased to put them on pair with the good techs. There is simply not enough time for the Devs to adjust test and readjust the various techs. Which leaves us back where we started either with three broken tech choices or two broken choices and one decent one.